Designed to be a low-cost craft for bringing crew to and from LKO.¨Intended for 6.4x scale with SMURFF at 0.5 lever and Stage Recovery. 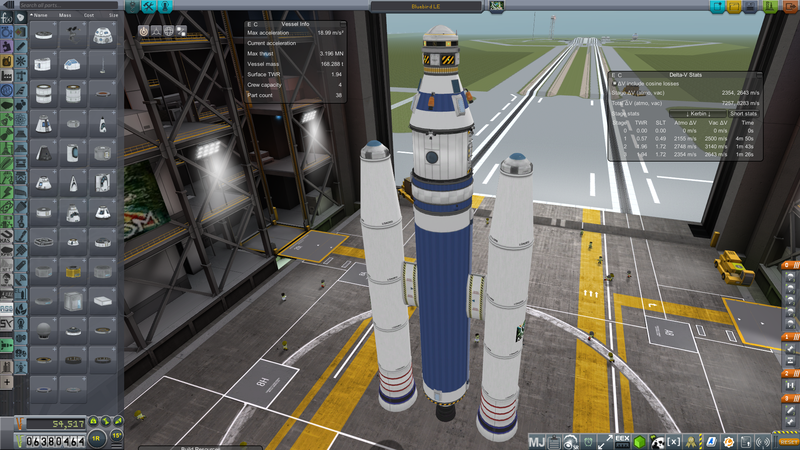 ¨Requires KJR, SpaceY and Fuel Tanks Plus.¨Transfer any remaining fuel to the bottom tank before reentry. With Stage Recovery installed and a recovery cutoff velocity of 4,500 m/s, all stages of the craft will be recovered - nothing is wasted. This was one of the primary ideas for this craft - everything is recovered. If the stock 2,000 m/s recovery threshold is used, then only one piece (the Skipper and LFO tank) will be discarded. A mod rocket called Bluebird LE. Built with 38 of the finest parts, its root part is probeStackSmall.